The spring and summer storm season is upon us, and sometimes those storms can be pretty tough to weather. If a warm weather storm leaves your property exposed to the elements, subject to vandalism, or structurally insecure, you’ll need to have a plan to ensure your family’s safety and security as soon as possible. The best advice for weathering a storm is to be prepared and know what you will do ahead of time. 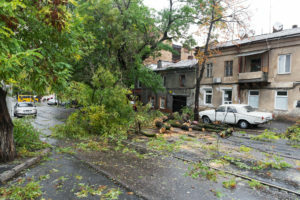 Here are some tips to help you return back normalcy in the aftermath of a storm that results in the need for board-up service, roof repair and storm damage restoration. Document, document, document. Make sure you have an up-to-date inventory of your possessions, along with photos of each room in your house, and receipts for all large purchases. Keep these things in a waterproof/fireproof safe, or store them online for easy access in a time of need. Practice your emergency plan. Create and rehearse an emergency plan so that your family knows what to do in the event of a storm. In the very least, everyone should know where to go, what to do and how to find each other afterwards. Create a safe space. Identify a space to shelter in your basement or lower floor room without windows and stock it with an emergency kit of supplies including food, water, batteries and medications. Stay on top of maintenance. Some storm damage can be prevented by making sure the exterior of your home as well as surrounding trees are regularly maintained. After the storm, if your property is exposed or structurally unsound. Call to get board-up service immediately. Call Hays + Sons, who will board-up windows and doors, secure and protect your roof and stabilize any structurally unsound areas to prevent further wind and water damage, and secure your home. The restoration company will also assess the damage, take pictures, prepare an estimate, and help you gather the information you need for your insurance company so you can get the storm damage repaired. Assess and prevent additional damage inside. Before the restoration company arrives to board up your property, you can check for leaks. Don’t go in any area that may be structurally unsound, but you can wipe up excess water and place buckets under leaks until your restoration company arrives. Check for more damage outside. From the ground, inspect the exterior of your house. Examine your windows, siding, gutters, air conditioning units, soffits and vent covers. Also, make sure to have someone check for storm damage in hard-to-reach areas such as your roof, chimney, and exhaust pipes. If there was hail during the storm, make sure to look for the tell-tale or “dimpling” on surfaces. Storms can be unpredictable, and no matter how prepared you are, you may incur storm damage requiring board-up service and restoration. The best you can do is know what steps you’ll take to weather the storm and restore your peace of mind as soon as possible. While we hope that you never need our board-up and storm restoration services, we know the stress and mess that can be caused by storm damage. It’s good to know that the team of certified and trained fire restoration experts at Hays + Sons are just a phone call away, 24 hours a day, 7 days a week, 365 days a year. With 140 employees, 120 vehicles, and eight separate locations, Hays + Sons has you covered.